By now you must have watched the embarrassing video of the Inspector General of Police, Ibrahim Kpotum Idris, giving a speech somewhere in Kano. If you have not watched it, then do yourself a favour and please watch it. You can thank me later. Or not. The video is beyond embarrassing. I am not even sure that the word to describe that video has been coined by linguists. I am still searching. I may be wrong. But truly you need to watch the video to understand the ineptitude of the Buhari administration which has led to the unprecedented nationwide insecurity in Nigeria. How can a man who cannot express himself be expected to expressly implement Nigeria’s policing plan? 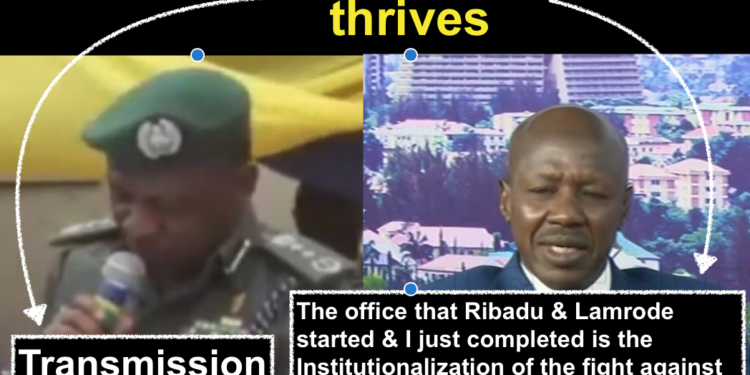 How did IGP Idris rise to his exalted position? Where his promotion examinations administered in his native language? Too many questions are begging for answers. Too many. Now, we know the real reason why the Inspector General of Police failed to honour the Nigerian Senate’s summons. The poor man did not want to expose his inability to read and understand the English language. We have a President who preferred to hire 13 SANs rather than just provide his WAEC Certificate, an Economic and Financial Crimes Commission Chairman who wears a Muhammadu Buhari re-election lapel pin, a minister of finance who cannot perform elementary mathematics and now an IGP who cannot read a speech in simple English. How did we get here? This government looks more like Humpty Dumpty and the King’s clowns! First, R. Kelly released the hit single IGNITION. Not to be outdone, Nigeria’s Inspector General of Police, who is also a budding rapper, Ibrahim Kpotum Idris, released his own rap single titled TRANSMISSION. The song is so hot that iTunes and other streaming music platforms crashed the moment it was released. I also received word that the Transmission Company of Nigeria has appointed IGP Ibrahim Kpotum Idris as its Brand Ambassador. Congratulations sir! How many times do you have to say the word transmission? Z$ 1 million to the first person who can tell us how many times Nigeria’s Inspector General of Police, Ibrahim Kpotum Idris used the word ‘TRANSMISSION’ while rapping (or reading) his now infamous Kano speech. Nigeria urgently needs to solve this national dilemma! But on a serious note, the case of IGP Ibrahim Kpotum Idris is a good lesson on why a State Commissioner of Police should not be promoted over his more capable seniors and made Inspector General of Police. The man is obviously not qualified for the job. Every sensitive security position does not have to be held by a Northern Muslim. It is this type of nepotism that has brought Nigeria to this sorry level under Buhari! And it was rather comical for the Presidency, through Abike Dabiri, to say that IGP Ibrahim Kpotum Idris’ ‘TRANSMISSION’ rap video was doctored. Well again, it is not impossible. Since that is what the Buhari administration is claiming, can they please produce the original video before it was ‘doctored’? Or have rats eaten the original tape? I think that rather than being embarrassed by the IGP’s video, the Buhari government should be proud of producing such a talented appointee. People keep saying Buhari’s cabinet lacks talent. Well, they can point to Idris as a talented rapper and shut the critics up! The Idris video should be a wake-up call for President Muhammadu Buhari. After the Inspector General disobeyed (allegedly) the President’s orders to relocate to Benue state to personally take responsibility of bringing the state of insecurity there to an end, one would have expected the President to at least sanction the police boss for his gross insubordination and incompetence. If the incompetence of the IGP was not clear to President Buhari then, it must at least be glaring now. It is sad to see the level of decay and morass that the Nigerian Police Force has fallen under because of the President’s penchant for nepotistic appointments. As it stands now, there is no salvific value in the top leadership of the Force and it is not just the IGP. On the morning of Tuesday May 15, 2018, Nigerians woke up to the strange sight of the acting Chairman of the Economic and Financial Crimes Commission, EFCC, giving an interview on ‘Sunrise Daily’, a breakfast TV show on Channels Television, wearing a lapel pin promoting the re-election of President Muhammadu Buhari. Not since the dark days of General Sani Abacha have Nigerians seen this type of disturbing behaviour. Nigerian Civil servants are mandated by law to be politically neutral in order that all civil servants can render unbiased and loyal service to any government that comes to power legitimately, irrespective of the political party that produced such a government. Furthermore, in a resolution adopted by the United Nations General Assembly regarding the International Code of Conduct for Public Officials, for which Nigeria is a signatory and bound by, the UN stated in the 11th principle that: “the political or other activity of public officials outside the scope of their office shall, in accordance with laws and administrative policies, not be such as to impair public confidence in the impartial performance of their functions and duties”. That being the case, how can President Muhammadu Buhari, who swore on the Quran to abide by the Constitution of Nigeria which produced our civil service, stand idly by while his political appointee brazenly and with impunity goes against domestic and international laws as well as the principles of natural justice? ‪Someone should remind Ibrahim Magu that it was the PDP that created the EFCC and not Muhammadu Buhari. And in the 16 years that the PDP governed Nigeria, not one of the chairmen of the EFCC appointed by PDP ever wore a lapel pin promoting the re-election of the PDP President who appointed him. If they had done so, would the EFCC have survived long enough for Magu to perpetrate his shameful aberration? Just a little food for thought for Magu and his god, Buhari. The Economic and Financial Crimes Commission, is meant to be a neutral enforcer of Nigeria’s laws on economic and Financial Crimes, but when the head of the body brazenly shows his partiality, how can those laws be applied impartially? How can an open sympathizer of the All Progressive Congress be expected to conduct a fair and balance war on corruption? Perhaps now, Nigerians and the international community will believe me when I say that the EFCC under Buhari is nothing more than the armed wing of the APC. The agency has in effect been ‘transmission’ (apologies to the IGP) to the Gestapo of the Presidency. And the sad thing is that, with the evidence of decay so glaring all around him, President Buhari insists on insulting the intelligence of Nigerians by claiming that he has performed better than the Jonathan administration. Nigeria was the world’s third fastest growing economy under Jonathan. We are not even in the top 100 today. Nigeria was 136 in Transparency International’s Corruption Perception Index under Jonathan. We are 148 today. Yet Buhari has the guts to say he performed better than Jonathan? Perhaps it is not only his IGP that has Transmission issues! Obviously the President has Transmission problem. He is unable to see reality and transmit it to his mind for appropriate interpretation. Your co-workers are your colleagues, not your friends. They are not at the office because they are looking for friends. They are there because, like you, they are looking for money. If you confide things to them, they are likely to betray you if it means they benefit financially. So don’t be deceived by appearances.